An amazing food chopper and so much more! The Ultra Chef Express is a 7 in 1 kitchen gadget that will save you time and effort when preparing all sorts of foods. It's indispensable as a chopper, but with the collection of extra parts it comes with, you can also whip, juice, shred, slice and more. Make hash browns for breakfast, mix up a meatloaf for dinner, chop onions without any tears, prepare salsa, mix cake batter, the possibilities are nearly endless with this powerful tool. Just turn the crank to spin the blades, and anything inside will cut with ease. Thanks to the super sharp blades, and precise, manual operation, you can easily achieve any consistency you want. Spin a few times for large chunks, spin more for smaller ones, and keep on turning if you want to puree the food inside. The clear bowl allows you to see exactly what's going on, and the sealed chamber contains smells and messes that would otherwise annoy you. This deluxe chopper comes with many additional attachments to add to its usefulness, so it's much more than a chopping tool. Get it to dice onions and tomatoes with incredible speed and accuracy, but then experiment with the other parts to discover all of the other tasks it can handle. The Ultra Chef is similar to our Salsa Express Miracle Chopper, and Kitchen Plus, but this package is unique in comparison. It's most similar to the Kitchen Plus, but this one features a storage lid, a slightly different container design, and the curving, samurai cutting blade. The Kitchen Plus comes with a grating attachment that you won't get with this model. If you are looking for a more basic basic version, then the Salsa Express or Manual Food Processor would be the way to go. 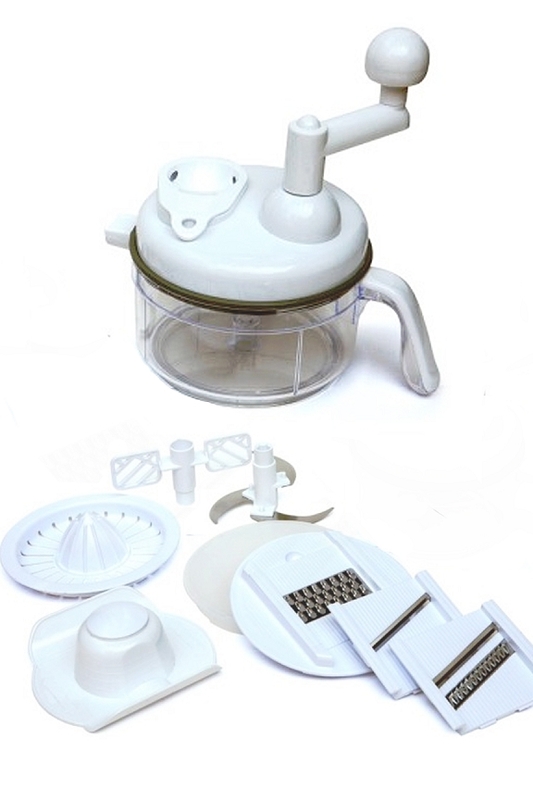 The first one comes with only a chopping blade and egg separator, while the latter comes with a cutting blade, whipping blade, salad spinner and egg separator. Efficient. A simple spin allows you to cut 20 times faster than you can with a knife. You can finish, in a matter of seconds, what used to take you several minutes by hand. Accurate. Make anything from home fries to baby food, and ensure that it has the perfect consistency. Hand powered operation allows you to observe the results, and stop at the precise moment when the food is the size you want it. Triple Blade. High quality stainless steel is used to create three curving blades with razor sharp edges. Each rotation will result in multiple cuts in multiple locations, and because it slices through at several heights, you ensure a uniform chop, no matter how full the bowl is. Hard food or soft can be sliced just as easily with this tool. Versatile. A 7 in 1 tool that just about does it all. This gadget makes a perfect addition to any kitchen because it's so darn useful. Chop like a champion, but also slice, whip, blend, shred and juice with professional results. 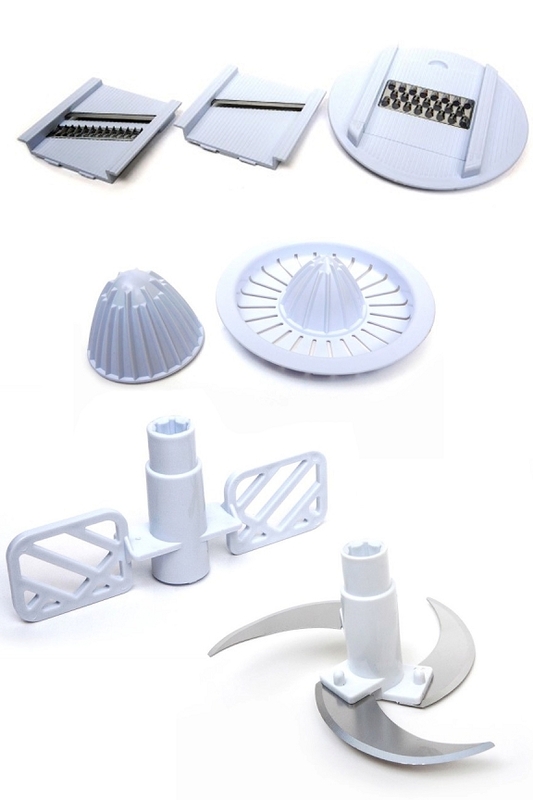 The additional parts in this set are not just filler. They add real functionality that you will find incredibly useful. Contained. Onion juice can make you cry, and garlic stinks, but when you chop it with this tool, you would never know. Messy sauces remain contained, and stinky odors never hit your olfactories. With the completely contained design messes are reduced, clean up is easy, and crying over food prep is a thing of the past. Simple Storage. All parts nest conveniently right in the bowl, so storing this set is easy. Easily find room in your cupboard for the compact space it requires when not in use. Crank Powered. Electric machines can be bulky and expensive, and they don't always allow for the results you desire. There's no need to plug this one in, and because it's so affordable, it can be used occasionally, or everyday, and still remain valuable. Easy to Clean. Cleaning comparable tools and appliances can be tough and time consuming. This one is incredibly simple to clean because it comes completely apart in seconds. Just disassemble and quickly wash clean, then air dry to finish. Slicing Insert - Slice tomatoes and onions for sandwiches, or slice oranges for breakfast, garnish or snacks. This part slides into the lid to give you a single thickness slicing tool. Use the food holder to slide stuff back and forth, and cut it with a uniform thickness. Each piece you cut will be perfectly sized, and it will drop right down into the bowl below. Julienne Insert - Slide this blade into position to cut thin strips for salads and sides. Each pass will result in several sticks with an identical thickness. It's perfect for carrots, zucchini, and other veggies. Use it with cabbage to make coleslaw, potatoes for hash browns, or use it with squash to make a vegetarian pasta. Once in place, just glide foods back and forth to produce piles of strips in the bowl below. Shredding Insert - Slip this insert into the lid anytime you need to shred cheese, lettuce or anything similar. It's much like a standard cheese grating blade, so do cheddar and iceberg for taco night, or use with potatoes at breakfast time. THe stainless steel blade makes hard or soft foods easy to work with, and allows stuff to slide back and forth easily. Because it becomes part of the lid, anything you shred will be captured and contained in the bowl below. Storage Lid - Handy for saving stuff for later, this chopper comes with a large lid to cover the bowl. Prepare ingredients ahead of time, or save your finished product in the fridge without creating another dirty dish. Simply press in place to create an airtight seal, and store food inside without it going bad. Citrus Juicer - There's nothing better than fresh squeezed juice, and with this attachment available, you can have it anytime you want. Use with oranges, grapefruits, lemons, limes, tangerines and more to squeeze out fresh juice right into the container. Use it to prepare juice to drink, or use it when recipes call for lemon and other juices. Simply cut in half and place one half at a time onto the juicer. Press down while twisting to press out every last drop. As the liquid is extracted, it will drop down into the container automatically. Whipping Blade - Most people get this tool for it's chopping and slicing abilities, but the additional plastic blade adds in a whole host of abilities that anyone would find useful. Simply install instead of the metal blade to whip cream, stir batter, beat eggs, or combine liquid ingredients. With the speed and power you can achieve, it acts like a hand held blender to whip desserts, pancake batter, yogurt and more. Spin in either direction to whip and mix with ease. Food Holder - To protect your fingers, and prevent accidental injuries, but also allow you to use more of the food you are working with, this set includes a safety holder. Metal prongs will allow you to poke vegetables securely, and the pusher allows you to press out, and cut, every last part. Samurai Blade - Preferred by some, this model has a a triple blade with a curved edge. Micro serrations on the outside of the curve create a razor sharp edge that powers through just about anything. Chop hard vegetables or soft fruits with the same speed, precision and accuracy. This machine does it all. It's one of the best manual food processors you can buy, and it makes quick work of all kinds of fruits and vegetables. With just a slight turn of the handle, you'll be able to chop, mix or blend faster and easier than ever. It's the ideal tool for making homemade salsa, but with the host of additional attachments, you are sure to find many other jobs it can help with. This super food chopper will cut stuff up 20 times faster than you can by hand, and the specially designed blades power through tough veggies like a hot knife through butter. Easily save time and money when you start using this incredibly versatile chopper. With the included recipe book, you'll be able to make fresh salsa for just pennies, as well as milkshakes, dips, salads, meatloaf, omlettes and more. The possibilities are nearly endless. Chop onions without crying, and garlic without stinking up the kitchen thanks to the airtight chopping chamber. 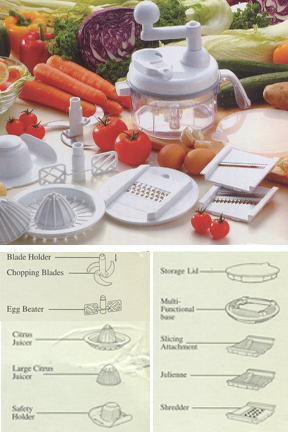 Carrots, celery, fresh herbs, nuts, eggs, lettuce, cabbage, meat and more can be easily chopped using the spinning blade at the center, but the slicing inserts really add value to this great gadget. 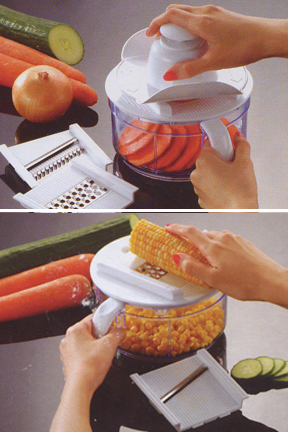 Cut tomato slices with incredible accuracy, grate cheese for tacos, or take corn off the cob to make it easier to eat. You can even make a pile of hash browns or french fries in a matter of seconds. Anyone can use this chopper to save time, money and effort when preparing food. Dice a single vegetable, or chop several at once and have them mix together, evenly as you go. The crank handle at the top is easy for anyone to turn, and the sharp blades reduce resistance to make cutting effortless. Follow the instructions and tips below to use this machine to make food like a pro. To begin, just place your food into the machine and then secure the lid. For larger veggies, cut in half or quarters prior to adding. To chop, simply spin the handle in a clockwise direction. Your food is chopped much faster than by hand, and there is no mess. All of the odors and food pieces are contained within the chopper so your counters stay clean and pungent vegetables won't affect you. For blending and whipping, switch out the sharp, metal blade for the plastic whipping blade. Once in place, use the crank handle to operate. Add multiple ingredients at once to chop and mix at the same time. The unique pouring spout makes it easy to mix and pour liquids. When not in use, a cap is provided to cover the opening. To save stuff for later, or bring it with you on the go, replace the crank handle lid with the clear storage lid. Just press into place for an airtight seal. To juice, secure the juicing lid at the top, then take one half of any citrus fruit and press onto the center. Apply downward pressure and twist to release liquid into the bowl below. To grate, shred, slice or julienne, use the interchangeable slicing lid. The center inserts slide in and out to give you the cut you need. When slicing, secure food into the food holder, then slide back and forth to cut. Resulting food pieces will drop down to collect in the bowl. Hand wash and air dry when dirty. No plugs or wires because no electricity is needed. This simple yet effective tool can be used almost anywhere to prepare gourmet style food in less time. It is super safe, highly effective, and durable enough to last for years with regular use. Stop chopping food by hand, and stop pulverizing veggies into mush when you would prefer small chunks. This chopper allows for extreme accuracy, amazing speed, and professional looking results no matter who is using it. With simple operation, a versatile design, and high quality components, this tool would make a great addition to any kitchen. No longer will you struggle with dangerous cutlery, or become frustrated by overpriced electronics that don't deliver. The Ultra Chef Express is an incredible little gadget. It makes cumbersome electric processors a thing of the past, and with its unique design and convenient attachments, it makes cooking and baking easy, even for those without experience. Dimensions 9" x 9" x 11.5"
Dishwasher Safe No. Hand washing is recommended. Just place your food in the chopper and spin the handle to chop faster and easier than ever before. You will be amazed at how well it chops and how easy it is to use. The wealth of additional attachments only adds to the value of this great device. Order Yours Today! Love Love Love this handy kitchen item and so does everyone I've gifted it to! I've had this chopper for years. We live in Michigan and soups are a staple here. I use it primarily for veggies and slicing potatoes for scalloped potatoes. After many many years it was time to replace my old chopper. The handle was starting to slip and the side handle fell off frequently. I was pleasantly surprised to find out I could still buy this type of chopper. The side handle has been redesigned from my original one. It's much nicer, more study. I didn't realize how my blades had dulled through out the years. The new one is super sharp. There is a learning curve when using this chopper. If you overfill it with veggies the handle will strip out. Its plastic after all. Dense vegetables such as carrots need to be done in small batches. If you are struggling to turn the crank, it's over filled. Vegetables such as peppers and onions need no more than about 5 turns of the handle. Carrots and celery a few more. The top needs only to be rinsed under running water to clean it. If you submerge it in water the top will fill up with water inside and you wont be able to get it all out. Number one tool in my kitchen.I can not do anything in my kitchen without this perfectly perfect thing. In the short line I am handicapped without this. My husband and I bought one of these a couple of years ago and we love it! We use it primarily for chopping and use it several times a week. We bought 2 as Christmas gifts for our married kids! I have used for chopping, dicing, slicing and mixing. I love it, easy to use and clean. Have used this model for years for everyday cooking and canning. Bought two of these for backup. Indispensable. I have used these for many years. I love them. The only problem I have ever had with them, is the handle on the bowl, is not very strong and I can only get about 8 to 12 months use before it breaks off. Other than that it is a good product. This chopper with curved blades is spectacular! With this I make salsa in 5 mins.-I can't eat salsa out anymore. These blades are so much better than straight blades. I bought 5! When friends compliment my salsa-they get a Ultra Express and my recipe! We ordered two (2) Ultra Chef Express food/veg plus choppers. The process was very easy. Simplygoodstuff confirmed our order immediately with what would happen. They notified us when the ordr was shipped. We were able to track the status all the way to our front door. The price was reasonable and they did everything they said they would do from beginning to delivery. We would use them again. Thank you Simplygoodstuff. love love ultra chef. Bought for my husband and hes very impressed. The Chef Express chopper is used in my house on a daily basis. I cook with allot of onions and garlic along with making sauces. I enjoy this product so much that I purchased 7 of these for Christmas to give to my family and best friend. It's quick, easy to clean and the best part is there is not much effort to chop. I like to wait for months before I give my opinion on products, it gives me plenty of time to give an honest, true evaluation. I love my Ultra Chef Express. A couple of concessions points: I do not use all of the attachments. However, I use the main container, blade and handle at least 2 or 3 and sometimes 4 times a day. I have an adult family member who cannot chew and I chop their meals for them with the Chef Express. I am NOT easy on it either. I chop almost all raw veggies and fruits and not all soft ones….I chop rutabagas, carrots, turnips, beets, cabbage, cauliflower, in addition to softer items. I do pre-cut them into about prune size pieces now but wasn't when I first got it, I was leaving them about twice that size and the chopper still did the job (it was just kind of hard on my arm). After a year my chopper does have some small stress cracks on the bottom but they do not affect the performance and they do not leak. I use this probably about 20 times more than most people would and chop much harder food than usual. This truly has been a godsend for me. I can choose how large or small I want the food chunks to be, so that it can be chunky or pureed depending on what I'm serving. Mechanical products totally made mush out of the food. I am so glad I found this product. If it ever starts to give out on me, I will be ordering another one. BTW the Customer Service Dept. was the most polite I have dealt with in a long time and I loved it that I got to talk to a real person : ) I am a very happy customer. If you are looking for a slicer that can handle something harder than a soft tomato forget it. I opened the slicer put 2 onions cut in halves and went to slice them up and the handle stripped. The handle mechanism is too small for how it fits in to the blade and therefore any pressure on it, it will strip. That's just great considering I bought "3" of them thinking I would give them as gifts.. I originally purchased the Chef Express at the MN State Fair. After 10+ years the handle broke of the bottom unit. I can't live without the express so I was happy to see it available here. It's the same product, all my old accessories work with this unit, but price was substantially less. Love Love Love this handy kitchen item and so does everyone I've gifted it to! This is my second Ultra Chef Express. One for the home and one for the vacation home. I use it mainly for Salsa but also for fries. it makes shoestring fries which the grandchildren love. I would not trade it. Although I received a Salsa Maker, it's really just different packaging from the Express Chef. This is my third one and I got it as a gift for someone who fell in love with mine. It does everything, but what I like the most is that I can work with onions and not cry. I have the Ultra Chef Express and it is a great addition to the kitchen. I used many different chopping systems and this is the world's best salasa chopper. It chops without pureeing the ingredients. I like the slicer/grater. The whol system is great. A very nice chopper if you need finely chopped veggies-chopped, not mush like the magic bullet seems to always make (though the bullet has its place too). I've used it on onions, peppers & tomatoes so far & salsa or bruchetta is a snap to make with this chopper. Only other accessory I used was the grater (for romano) & that was a little work to do & the slicer for onions & tomatoes (that was pretty easy. One warning-watch out for all the blades, they are super SHARP. If you have to do a lot of dicing-this is the way to go. I got a Salsa Express as a gift at Christmas, Just opened it to use for the 1st time and it was missing the crank handle! hate to toss it, and don't want to ask where they bought it after this long... any chance you have them? Yes. Please give us a call. We usually have some of these available in the warehouse. Who makes the ultra chef express and how do you get replacement parts? We get them direct from the factory. Not sure which part you need, but if you give us a call, we should be able to help you out. Bought my Ultra Chef Express exactly a year ago at a local craft show. I make a lot of salsa so I thought it would be perfect for me. It is AMAZING!! Chops everything perfectly. BUT - as I was using it today, the handle started slipping. It turns but doesn't turn the blade. It's almost like either the blade gear or the handle gear is stripped. What can I do? I can't live without this little guy!!! The gears inside are plastic, so it's possible for them to strip over time, or when worked too hard. It sounds like this is what happened to you. You may need a new crank, you may need a new lid, or you may need both depending on which parts are affected. Please give us a call, and we would be happy to help you with this problem. My main bowl has cracked. How can I get a replacement? Give us a call. We don't always have one available, but someone would be happy to check for you and sell you one if currently in stock. We may have an extra available in the warehouse. Otherwise, someone would be happy to walk you through whichever process you are having trouble with, or are unsure of. Please give us a quick call at your convenience. Purchased recently and love. Is there a more comprehensive instruction manual?. Recently sliced my thumb fairly severely. Not sure how to use hat or square inserts for what. Thank you. Glad you like it. Unfortunately, there is no other instruction book available, but we are here to help with anything you are unsure of. The hat is a food holder for use with the square slicing inserts. The inserts are interchangeable, so you only use one at a time. The holder will poke the food and secure it and the inserts are for slicing, shredding or julienne cutting. When you slice using the food holder, you protect your thumb against further injury. Everything you cut will fall right into the bowl. Where is it made ? And how can i be confident that it would work and not break ? You can be confident about the quality because we sell it, and stand behind it. It is made in China. I need a replacement blade how can I get one? We will occasionally have extra blades available. Please give us a call to check availability, order one over the phone. If you lost the handle, we can probably help you out. Give us a call and someone can check availability for that part, and take your order over the phone. Will this slice Cabbage to very thin? Yes it will. In fact, it comes with a coleslaw recipe right in the box. How can I make French fries with this machine? You can make thin, shoestring style fries with the julienne lid that's included with this chopper. Just install the blade, and use the food holder to slide your potato back and forth. Long thin strips will drop into the bowl below. For thicker french fries something like the V-Slicer: http://www.simplygoodstuff.com/borner_vslicer.html is a better choice. Can you chop cold butter and blend with sugar using this tool? You sure can. It works really well for this. I've used mine one time to cut up tomatoes and the gears sound like they're slipping is there something I need to tighten up I can turn it backwards and it won't slip if I turn it to chop the gears slip ? You may have stripped the gears, or you may have a defective unit. Please give us a call so we can help you solve the problem. An 8 in 1 Kitchen Miracle. The Fast and Easy Way To Cook.